It’s pretty typical that your friends and family will ask you what your fave highlights are after you return home from a trip. And normally, you’ll say something like “visiting the Chichen Itza was pretty cool” during your stay at an all inclusive resort in the Mayan Riviera in Mexico. Or you’ll say something like “the beaches were STUNNING” during your trip to Thailand. But when you’re gone for 3 months and every single day is a whole new adventure, it’s pretty freakin’ tough to pick and choose favourite moments. I can’t begin to tell you how many memories we’ve made or experiences we had the chance to collect during this trip - it’s safe to say we’ve built quite the library of stories we’ll be reminiscing on for a lifetime. Although it was tough to pick and choose, Kev and I have rounded up our top ten fave days to share with you. I kid you not, El Nido has the most incredible waters I (and maybe you) have ever seen. There’s nothing like it. It’s crystal clear - the type of clear you’re meters and meters above the ocean floor, but you can’t really tell how deep it actually is because you can still see the bottom of the ocean. The type of crystal clear you’re like “hey maybe I can touch here” but no, you most certainly CANNOT touch. And it’s the type of turquoise blue that I can’t really describe in any word other than magic. It’s got this shimmery effect to it that reflects the sun’s sparkles and you can’t help but stop and think to yourself “WOW”. So picture this water (your imagination will not do it justice, but do it anyway) and picture yourself renting a couple kayaks from an old lady on the shore of El Nido’s main island, kayaking off the coast for about an hour, with your main squeeze, your two uber cool friends, a makeshift water bag cooler filled with ice blocks and beer, some loaves of bread (that will taste like paperbags by the time you eat it) - and discovering your own private beach on your own private island. And picture sitting waist deep in the magical waters, sipping on lukewarm beers, basking in the sun with the music on high and simply enjoying the company of your people. Mount Agung is an active volcano - a volcano we had planned to climb. But it erupted a month before our trip and continued to erupt during our stay in Bali. We almost re-routed our trip to exclude Bali, but we headed there anyway (don’t worry, we were safe) and climbed another active volcano instead. Its name is Mount Batur. At 1717m above sea level and an estimated 2 hour trek to the peak, we started our hike at 3am in order to make it to the top for sunrise. The grueling trek in the pitch blackness of the night, the waiting at the peak in the cold for the sun to rise, the attack of the monkeys (that’s a story for another day), the dangerous decline - it was all worth the incredible views we were able to see from the top. I had been to Singapore once before and although I didn’t have a chance to see the Supertrees up close the first time around, the five year long wait was so worth it. They’re jaw dropping in both the daytime and the night time. Kev and I rented a motorbike to get us from the city of Hoi An to Hue which should have taken 4 hours, but instead took us 7. The bike breaking down, the phone being crushed by an eighteen wheeler, the 3 x empty gas tanks, the flat tire, the replaced battery, and our luggage being held ransom may have caused for a longer journey, but we made it in one piece and the ride was truly worth it. Since this is a post on our “fave moments”, I won’t go into the details of the mishaps during this journey. However, the scenic route that took us passed long beautiful beaches, into dips and turns through the mountains overlooking deep green valleys that touch the blue ocean made us forget about all the troubles we were put through. Not only is the sight of the Angkor temple grounds unbelievable, the history and architecture behind them are equally as mind blowing. The 900 year old temples are typically pretty busy crowded with tourists, but quietly walking through secluded corners of the grounds and getting lost between ancient stones proves just how enormous and grand the grounds really are. 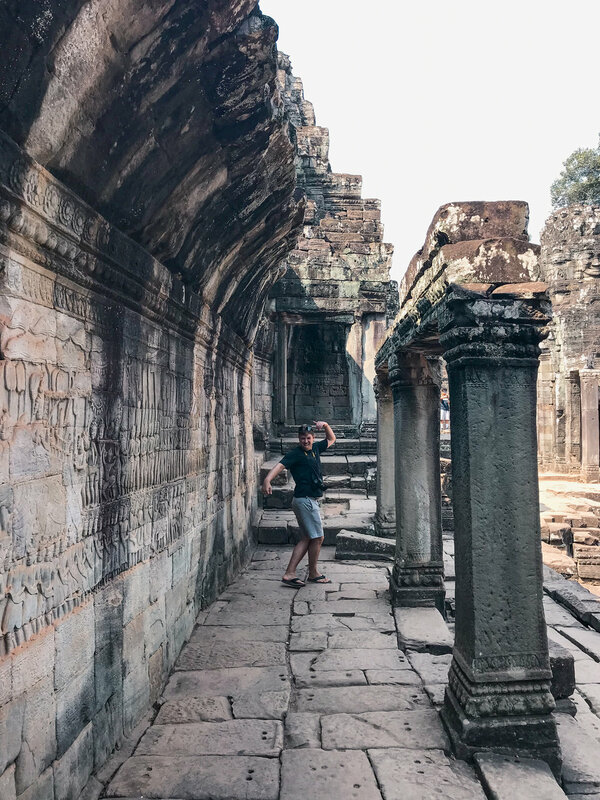 Kev and I got a three day pass for the Angkor Archaeological Park and spent our sweet time walking through the various areas - those days were filled with a lot of quiet astonishment. I wrote a full blog post on this story here. But the gist is that we found an abandoned airplane on Google Earth while we were staying in Bali and decided to venture off and find it. And we did find it. Kev’s a big F1 fan. But more than that, he’s got this obsession with the sound cars make when they go fast. And since the Sepang International Circuit, a former Formula 1 track, was only a short hop away from Kuala Lumpur in Malaysia, AND the Asian Le Mans Series were being held there during our stay, we obviously made our way there. Needless to say, the cars were loud AF and Kev was happy. During our stay in Langkawi, a beautiful island in the north of Malaysia, we rented a car to get us around town. Just thinking about driving on the right side of the car, but on the left side of the road with no power steering was confusing enough for me, so Kev did all the driving. It was a Perodua Viva, but Kev called it his Malaysian Ferrari, and although it took a bit of time for him to stop turning the windshield wipers on instead of the signal lights and driving into the oncoming traffic lane, he eventually became a pro. I was severely sick during our stay in Langkawi, but on our last day there, Kev drove me to the highest point on the island on top of a mountain so we could see the city below us. I felt like poo and hadn’t left the hotel room for what felt like ages, but this day made it on the top moments list because as short and sweet as this adventure was, it was the company that made it extra perfect. Hoi An is a small city in Central Vietnam. Just to give you an idea of its vibe - the whole Ancient Town of Hoi An is a Unesco World Heritage Site. It’s got cobblestone streets, iconic yellow buildings, and ooold AF ladies who look like they’re pushing 100+, but hustle you like you’ve never been hustled. It’s filled with old world charm. So old that some homes are older than Canada, and that are still inhabited by generations of the original families. Cycling around Hoi An was the perfect way to explore the city, especially since most of the roads are closed off from motor vehicles. There was nothing quite like biking around on a scorching hot afternoon, followed by a bench rest over some iced tea and watching the ancient citizens of Hoi An hustle tourists. I had never been to a gun range before. But I decided to give it a SHOT. Ha - get it? Kev was obviously sold when they said he could shoot a gun they called “Rambo”. I opted for an M16. He finished his ten rounds in a fraction of the time it took me to get through mine, but what an exciting experience that was! Not all these “top moments” during our trip were perfect. Every day had its ups and downs but our most favourite moments happened because of 1. The company, and 2. We made the most of it. I mean, the beautiful backdrops and the exhilarating adventures definitely helped, but you can have “fave moments” just about anywhere.